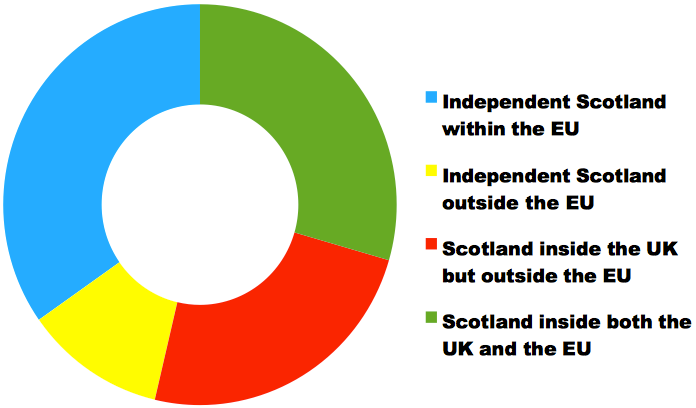 Today’s opinion poll asked voters to choose amongst four options for Scotland’s place in the world. Today’s Panelbase poll (coinciding with the 2nd anniversary of the first independence referendum) very helpfully asked the respondents to pick their preferred scenario for Scotland’s place in the world. I’ve put the figures into a pie chart, ignoring the 5% who are undecided, to make it easier to spot the possible majorities. To make it easier to discuss the four groupings, I’ll refer to them by colour in the following. 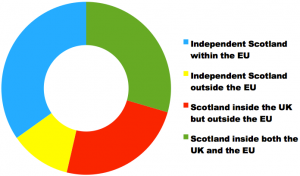 The blue tribe consists of the 33% of voters who want Scotland to be an independent country inside the EU; the yellow tribe is made up of the 11% who want Scotland to be a completely independent country outside both the UK and the EU; the green tribe is home to the pro-EU unionists who were perfectly happy inside both unions (28% of voters); and finally the red tribe is made up of the 23% of voters who are pro-UK Brexiters. The question now is what happens in Indyref2. The green tribe has just become politically homeless because their preferred option simply doesn’t exist any more. Will they eventually join the blue tribe or the red one? Wings over Scotland today focuses on the yellow tribe (or the “unhappy 11%”, as he calls them). However, I don’t think that’s a big worry. At the end of the day, they are in favour of an independent Scotland, and even though they might not be very active during the next campaign, I can’t imagine that many of them will actually vote No to independence — surely they’ll just start a UKIP-like party in Scotland post-independence. The green tribe is our big opportunity. They’re not happy with the outcome of the Brexit referendum, and they need to rethink their political priorities. If Brexit turns out to mean a soft Brexit (a.k.a. the Norwegian solution), they might eventually join the red tribe, but if it seems like the UK is opting for a hard Brexit, it should be easy to convince most of them that joining the blue tribe is the internationalist and outward-looking position, and that will enable us to win a landslide victory in the next independence referendum. Let’s not get so focused on keeping together the Indyref1 coalition that we completely miss the opportunity to assemble a much bigger Indyref2 coalition. This assumes that many Green tribe members are idealistic and concerned with their self-image, rather than with economic arguments, since a Hard Brexit would be the most damaging to trade between the UK and a Scotland that was in the EU. I think it’s unlikely that they will switch en masse, resulting in a landslide. It’s more likely that a few switchers could scrape us over the line, but even that’s something I’m not willing to bet on. It is a very good question what they’ll do. I’d like to see an opinion poll specifically of the green tribe (and perhaps also of the yellow one).